Cobham is a charming Surrey village on the banks of the River Mole, inside the M25 and almost equidistant between Heathrow and Gatwick airports. The ancient parish church of St Andrews retains much of its character including a Norman tower, 16th century brasses and stained glass window designed by Edward Burne-Jones. The beautifully restored Cobham Mill is open to the public every second Sunday afternoon of the month during April to October 2-5pm. Painshill Park is a wonderful 18th century parkland, lake and follies are a ‘Living Work of Art’ where visitors can enjoy fantastic views across Surrey. There is a wide variety of quality shops, businesses and restaurants in Cobham as well as ample parking in the Hollyhedge Road pay and display car park. 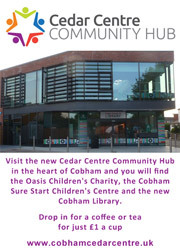 A short walk brings you into the centre of Cobham and to the many shops and services. To find a business or more information on a specific shop, click on the Find a Retailer or Business menu or click on the map below to download a larger map and full retailer/business list, along with their location.